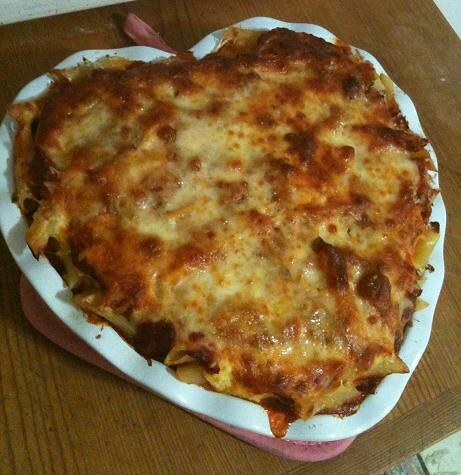 Homemade Valentine's Day this year - I made a card for Tim and instead of a heart shaped box of chocolates, I baked him a heart shaped pan of pasta for dinner. He L O V E D it and ate two huge plates full - I don't know where he puts it! I had one bite and my pants were tight, no fair! So sweet - when I woke up yesterday Tim left a card on the bathroom sink (first place I go in the morning). When I went to bed, I pulled blankets down and there was a box of my favorite (See's) chocolates on my pillow! That looks delicious, I love the heart shape. So funny, I got this dish at a sample sale when I worked for Williams-Sonoma and almost never use it - now I know I will at least use it once a year.